Nobody ever thought soap on the side of your basin looked stylish. Not only does it leave an ugly soapy residue on the side of the basin but there are those times when the soap just slides straight off. 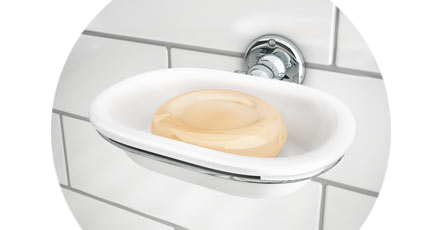 A soap dish will put an end to soapy residue on the basin and that annoying soap in the bowl. Liquid soap is probably the most common type of soap found in homes. Soap dispensers are perfect for storing liquid soap in an elegant way, putting an end to having an unattractive plastic bottle on your washbasin. Browse high quality freestanding and wall mounted soap dishes in a range of styles and colours to suit your bathroom. Looking for a soap dispenser instead? Find wall hung soap dispensers and freestanding dispensers in a range of elegant designs. Competitively priced, good quality item, arrived promptly.Says it all! Like the smooth touch anx look that it bring in my bathroom.